Blacktie - Have you met Gayle Novak? "You had me at hello!" was what several judges told Gayle Novak after they made her their choice for Ms. Senior America in Atlantic City on October 18, 2018. Gayle, who earlier this year just turned 60 years old, was excited to try someting new which would be fun and also inspirational. She wanted to push herself beyond any limits she had ever experienced. 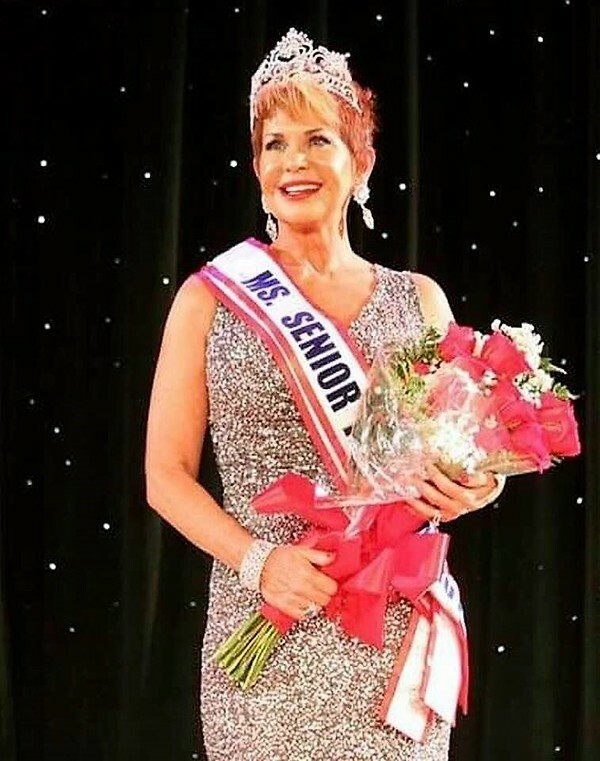 After meeting Rene Green, Colorado State Pageant Administrator for the Ms. Senior America Pageant, she was encouraged to become a Colorado pageant contestant. Novak had no fears or expectations of winning, she just wanted to build new friendships with like-minded woman, challenge herself with new experiences, and go out and do the best she could do. Gayle came up with a fun, unique, gritty & different performance of the song "Money, Money, Money" from the Broadway version of "Mama Mia" which showcased a piece of her up-beat, radiant personality and also allowed Novak to push her boundaries. She also shined in all the other categories, and out of 12 candidates was the winner of the 2018 Ms. Colorado Senior America Pageant. As the new reigning Ms. Senior America, Gayle Novak is having the time of her life with so much more yet to experience. She is glowingly fearless and looking forward to giving of herself to the community and helping other women be the best they can be. I had lunch with the very busy "Dancing Queen" at Zane's recently - where she will continue to stay involved with other member's of her family. Gayle Novak was still walking on air after just being given the crown.... which she wears with her trademarked pride and elegance. The “gorgeous” Gayle Novak is one busy lady. I knew she was involved with charitable causes – but I was surprised by how many. Gayle, along with her husband, Ed Novak, have forged a sterling reputation in Colorado. They are the owners and gracious hosts of the tried and true “The Broker Restaurant” downtown (listed as one of the top dining rooms in the U.S. - and home of the endless bowl of shrimp), two “The Egg and I” breakfast restaurants, and the “Cork House Wine Restaurant” – at the former “Tante Louise” location. The family-oriented Novaks give wholeheartedly of their time, money (+ gift certificates), and their energy to numerous organizations. Gayle stays active supporting The Denver Center for the Performing Arts, The Beacon Center, Excelsior Center for Youth, various cancer organizations, The Denver Zoo, and Muscular Dystrophy, to name a few; and she proudly takes over the Presidency of the Denver Center Alliance in 2009. When asked what the Novaks future might hold, warm and approachable Gayle said: “Traveling and spending time with grandchildren.” To capture this gem of a gal – you could say Gayle Novak is a shining example of class, elegance and certainly grace. Gayle, you gave a great philosophy of life remark for the pageants, can you share it with us? My life has been like a melody. There have been high notes and there have been low notes … yet I learned to persevere to the end of each song. I am grateful for the music, and I am looking forward to the rhapsodies yet to come. What will you do to keep your energy up? Eat a lot of pasta at Zane’s Italian Bistro! You have had ownership in other restaurants, what makes you most proud of Zane’s Italian Bistro, and how is it different from other similar places? Aside from our incredible food, I am proud of the casualness of the restaurant where a basketball team can drop in at any time, as well as school students, or couples going to or coming back from the theatre. There are no ethnic boundaries, and we are very kid and family friendly. So many people have fond memories of the Broker Restaurants which you and Ed owned. What made those restaurants so successful? They were elegant & romantic, served the best food…. And of course, the famous shrimp bowl! Aside from winning both crowns, what makes you the most proud? Raising good children. Ed & I feel so proud of taking in our niece, Angela, who was a neglected child getting bad grades, not eating properly, and Social Services had already gotten involved. We gave her love, respect, proper nutrition; and she began to flourish and gain self-confidence – along with her beautiful smile. We are so proud of Angela and how well she is doing now as an adult. You’ve always loved to travel. After the year’s Ms. Senior America duties are completed, where would you still love to go? Australia, Africa, Poland…. So many interesting countries yet to visit. How do you plan to “keep it real” for Gayle Novak Ms. Senior America? Continue to visit nursing homes, hospitals & schools…. Stay inspired to help those in need, and have a wonderful partnership with my husband. It’s great creating fun things to do together. Keep working at Zane’s Italian Bistro, and just loving my family! What does staying true to your own self mean to you? Learning from your mistakes, not letting anyone get in the way of your dreams, and accepting change. Along with your philosophy of life, what message do you have to all women out there young or old? Don’t ever give up no matter what highs or lows you have experienced. Just keep going, hold your head up - and keep believing in yourself. You are never too old to have a new beginning! There are so many great charitable events in Denver. Is there one - or two - you and Ed really look forward to attending? Yes. “Saturday Night Alive” for the DCPA and “Cherish the Children” which supports the Beacon Center. Aside from the Broker – or the Cork House – which other restaurants in town do you and Ed like to go to for an evening out? We like to stay close to home, and we go to Steakhouse 10 a lot, and we also love India’s in Tamarac Square . You are the next President of the Denver Center Alliance, what are you looking forward to accomplishing during your presidency? Continuing the funding to educate children about the theatre. We are primarily going to focus and concentrate on the educational programs – and really hone in on the transportation issues. Transportation is a real problem. We have the kids, and we have the theatre – what we need to do is pay for the buses that take the children from their schools to the theatre and find more solutions for the parking problems that come along with it. This is carrying on with what the current Presidents Cindi Burge and Jaylene Smith have been working on. Who is the wisest person you know? I would have to say my mom. She lives here in Colorado just a block away from us. Both of my parents are still living independently. My mom is 84 and my dad is almost 88. She gave me the gift of enjoying the performing arts – and taught me the importance of caring for other people. Tell us something that no one might know about you? I love horror movies! I have a collection of all the old classic horror movies. People are surprised by that…. What can always make you laugh? Probably my husband, a good comedy – and my grandkids. What do you hope the new President and his administration can achieve for our country in the next four years? Unity and to pull us up into a better economic state. And of course, peace in the world. And, continue to inspire entrepreneurs and encourage the growth of small businesses so everyone has an opportunity to follow their dream and their passion. In your opinion, what makes for a successful marriage?Just making sure it’s a partnership. It’s not always going to be an equal 50-50 – at times, somebody has to take a little bit and give a little bit. What’s your favorite television program these days? I love the history channel and the arts and education channels. What do you do to find balance in your life? I pray and travel. Do you like to travel? Yes, we enjoy travelling. What are your travel plans for this year? This year, we are going to Hawaii, Canada – and hoping to take our grandkids to Disneyland or Disney World – some of the little ones have never been there. The Broker Restaurant has been such a long-running tradition for outstanding dining in Denver. What do you do to maintain those standards? Number 1 - We have fabulous management and staff. You have kept many of the original formulas that always made The Broker great – like the unlimited shrimp and other classic dishes….. We have stayed true to our tradition. Honestly, our staff and management are the best; and taking care of the staff is oh so important. At the downtown Broker, we have retained at least 10 people who have been with us for the 36 years we have been in business. The average employee has about 17 years with us. What "uncharted waters" would you like to explore in the future? We really look forward to going to Australia.. We have been to Fiji and New Zealand and loved it over there – but now we are ready for Australia. We also would like to go to Poland. We had an amazing trip recently to Russia. It was somewhere we always wanted to go.